The 76ers could have star center Joel Embiid back in the lineup sooner rather than later. Embiid revealed Saturday that he expects to be back on the court sometime next week after missing the team's last five games due to left knee soreness. While he watched his team from the sideline during Philadelphia's 120-117 loss to the Warriors, he insisted that he could play now if he had to. He explained, however, there's no reason to push his return given where the 76ers are sitting at this point heading into the playoffs. Embiid's focus right now is on his long-term health. 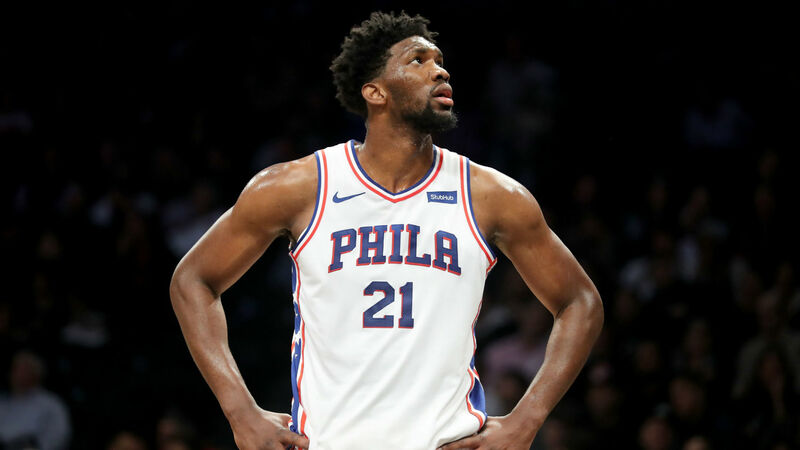 "It's all about long-term preservation and making sure I'm ready not just for the playoffs, but also for the next 15 years," Embiid said, per ESPN. "Knowing the team, what we've been through, and knowing me and I like to push everything, I like to play through anything. We just felt like it was better to preserve." Embiid explained he had been playing through back and knee soreness leading up to the All-Star break, and decided to undergo an MRI after the discomfort in his knee increased. "Game by game, I felt like it was getting worse," Embiid said. "I felt like me, personally, I didn't feel comfortable. Coming from me you know that if I don't want to push through anything, I really need [the rest]. "But I'm glad it was nothing, and the MRIs showed nothing, so it was good." Embiid is averaging 27.3 points and 13.5 rebounds this season while shooting 48.2 percent from the field and 29.5 percent from 3-point range.